This Boogiepop Phantom Complete TV Series collection contains episodes 1-12. Five years ago, a string of grisly murders shook the city to its core. Now terror has returned, and this time it has a name: Boogiepop. Everyone knows about Boogiepop: death incarnate, she stalks the night in search of fresh victims. Meet her, and you simply... vanish. In the darkness, glass shatters and time stands still... There's something out there, and it's coming closer. Are you safe? Special Features: Line Art Gallery, Producer Notes, Character Notes, Music Videos for Opening and Closing Themes, Original Fruits Music Video, Original Boogiepop Music Video, Original Japanese Promo Trailers, English-Language Producer's Commentary. 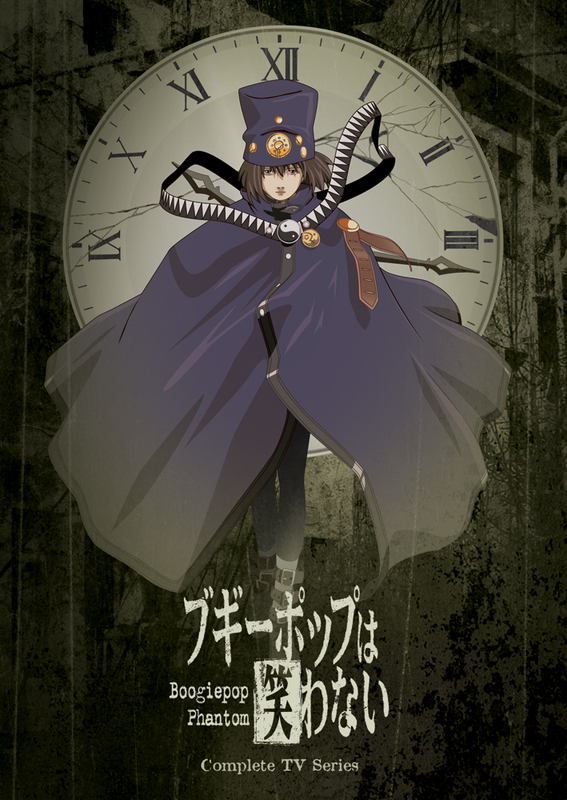 Boogiepop Phantom is a series in the vein of Serial Experiments Lain in that it will demand your attention as a viewer, but the reward is an engrossing viewing experience. BP is an urban legend ghost story not dissimilar to the Mothman legend, in which those that witness the phantom meet with an untimely end. It's short and sweet, drab and bleak, dense and demanding but the payoff is worth it in my opinion. Horror and supernatural fans will find a lot to like, as well as those that like intelligent cerebral stories. Great A/V quality and value on this DVD set make it an easy one to recommend. I agree with Kyle about this one, but I'd rate it higher than Lain, because of how intricately the various story lines are worked together. This is an anime to watch once, then start over immediately for the pleasure of seeing the overlapping elements. I already own a copy and am debating getting a new one at this price. Well, maybe the term "horror" is a bit overkill for this one. Don't expect buckets of gore and guts, but rather a bleak supernatural allegory that balances nail-biting suspense and bittersweet melancholy. Like your typical anthology, there are twelve episodes and each one tells a different story, but you will see scenes that intersect with previous ones and ones that you have yet to see, making all the episodes one whole story altogether. I recommend you watch one per week as with any airing program, listen to it, study it carefully before you move onto the next one. The crazy turn of events every few minutes can easily get you lost in confusion if you binge-watch them. Trust me on this, it will interest you into watching it a second time from the very beginning, giving you the utmost respect for the writers of this anime and their brilliant craft. They've certainly earned mine! I found this series and bought it on a whim, not knowing that the TV series is a direct continuation from the movie Boogiepop. I was VERY lost when I watched through and had to wiki to figure out what characters were referring to. It was an interesting watch though once I figured out that the story is really about the themes the writers/director are trying to convey, rather than a story about the characters. I've always loved this show, but it definitely takes some out of the box thinking and multiple re-watches in order to fully appreciate it. The episodes are slow and obscure and along the lines of Serial Experiments Lain mixed with Hell Girl. If you like that stuff, definitely check it out! I don’t mean “moody” in a bad way. Based on Kouhei Kadono’s light novels, Boogiepop Phantom owes much of its style not just to Kadono but to Western pulp and to the work of Sadayuki Murai. That event imbued some teens with abilities, and not the Marvel/DC kind, to put it mildly. The whole story is told in what is until the final episode a very muted color palette, layered in fuzz. The music draws from an eclectic group of electronic artists. This is not a show where you can watch an episode and come back to it a couple weeks later. You want to be able to digest the details and refer back to them later. But this is probably my favorite anime, and for me, the most unlikely gateway drug. This anime literally got me into anime. I was a young teen in middle school when my friend loaned me the first volume. I remember watching those first three episodes knowing I had to see more, I had to know how it continued. I begged her to let me borrow the rest, but to my shock she only owned the first one and had never seen the rest. I pleaded with my parents to buy me the set and I remember doing tons of extra chores to get it. The day it arrived, I remember racing up to my room to finally get to see the rest and I was not disappointed. Up to that point my experience with anime was just the general "craze" stuff that was on TV in America at the time. Things like DBZ, and Sailor Moon. I enjoyed those, but I wasn't an anime fan persay. Boogiepop changed that. With its interesting art design, eerie music and chilling story, Boogiepop will have you on the edge of your seat the entire time. All I ask is when will we get a bluray of this amazing anime? A complicated anime not for everyone, but maybe its for you. I found this anime while interesting to be a bit confusing, with all the out of order story, and each episode focused on a different character, loosely connected to the other episodes. There is lengthy plot summaries online on the total happenings in this anime but frankly if I have to do that to understand a 12 ep show it's not for me. If you're into deep physiological horror, and can understand all the themes, and plot this anime may be for you; as for me I give this an 6/10 for being an interesting but confusing ride at times.